I’ve been marking essays for the past week (two big advantages of Australian academia: November is a spring month, and second semester ends before Halloween), and a lot of my students were writing about the right to health and what it would take to realize it in a meaningful sense. That, naturally, led me to thinking about cholera. Few diseases can kill as rapidly as cholera. That alone should make it a key issue for global health. What makes cholera particularly important and interesting, though, is how much it says about our larger global health system and the interconnectedness between health and other issues. Cholera kills by dehydration. Spread by contaminated water or food, the Vibrio cholerae bacteria causes an acute watery diahhrea in as few as two hours. Even more problematically, only about a quarter of those infected with cholera express symptoms—but the bacteria can remain in an infected person’s feces for up to two weeks. As a result, when cholera gets into a community—especially communities without proper sanitation and drinking water sources—it can spread incredibly quickly. In 2015 alone, WHO recorded more than 172,000 cases of cholera and 1304 deaths. This is a significant drop from 2011, when there were nearly 600,000 cases. Fortunately, cholera is easily treatable with oral rehydration salts that restore fluids and electrolytes. With treatment, cholera’s fatality rate is less than 1 percent. There is also an oral cholera vaccine with a 65 percent efficacy rate when the two doses are given a week apart. Cholera is also renowned within epidemiological circles thanks to John Snow (no, not that one). Snow mapped an outbreak of cholera in London’s Soho section in 1854 and showed a connection between those who got sick from the disease and those who used the Broad Street water pump. You can still see the pump today (even if that means dragging your friends through the streets of London on a nerdy pilgrimage…or so I’ve been told). Snow’s worked helped to disprove the miasma theory of disease and showed that cholera was spread by contaminated water. If we know how cholera is spread and we have fairly easy, low-tech treatments for it, why are we still talking about cholera today? In a word, Haiti. Over the past 6 years, since an earthquake hit the country and killed more than 200,000, Haiti has experienced the worst cholera outbreak in recent history. More than 770,000 cases and nearly 10,000 deaths have been reported (and these numbers may substantially underestimate the real toll). That big spike in cholera infections in 2011? A lot of that is from this outbreak in Haiti. More recently, the effects of Hurricane Matthew in October have further exacerbated the problem, with at least 200 new cases popping up. If we want to understand the cholera outbreak in Haiti, we need to think about it on three different levels—all of which tie into larger lessons about global health politics and the difficulties in addressing global health issues. One, there’s the issue of infrastructure. It’s not a surprise that two massive natural disasters in six years would wreak havoc on these systems, but it’s also important that we consider the role that they play in any society. More than being urban improvements, though, sanitation systems and clean drinking water are fundamentally health interventions. If people have access to clean water and reliable systems to remove waste and treat water, they are less likely to die of cholera and other waterborne diseases. The second-largest cause of death for children under 5 in the world? Diarrheal diseases—the vast majority of which can be treated or prevented with proper water infrastructure. On the one hand, this seems like a cause for optimism—it’s an easy intervention! On the other hand, building or rebuilding these sorts of systems is not cheap. Addressing the cholera requires a long-term commitment to rebuilding Haiti’s infrastructure and to building up the country’s medical responses. If Paul Farmer’s take on the situation is any guide (and he’s a pretty smart guy), the international community’s history on implementing effective programs in Haiti isn’t cause for optimism. Two, Haiti isn’t some basket-case when it comes to cholera. The country had been cholera-free for about a century when the first cases appeared in 2010. Here’s the thing, though: cholera didn’t appear because of the hurricane itself. It emerged because of United Nations peacekeepers. The outbreak began near a base housing Nepali peacekeepers when waste from the base leaked into a nearby river that was used for drinking and washing. Scientific testing has proved that the cholera strain in Haiti is the same as one that had been circulating in Nepal. This has two implications. 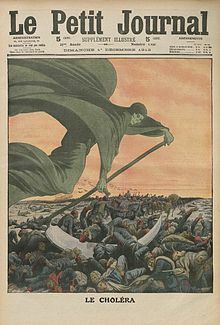 First, the spread of cholera is associated with the movement of people. Much like the outbreak in Peru in the early 1990s has been linked to the discharge of bilge water from a Chinese freighter, the Haitian outbreak is associated with population movement. This is a perfect illustration of how globalization challenges our global health response systems. Second, and perhaps even more importantly, the outbreak came from the very people who were supposed to help—and the United Nations refused to acknowledge the connection between the peacekeepers and the outbreak for nearly six years. Instead, the UN spent years arguing that public international law immunized the organization from claims of accountability and responsibility. The UN is now working on a $400 million plan to compensate victims, but it has not yet raised the funds and still claims immunity from paying any claims. Such an attitude does little to reassure Haitians that the international community cares for them or is willing to take responsibility for the outbreaks that it has caused. David Nabarro, the coordinator of the UN’s fight against cholera (and current WHO Director-General candidate), acknowledges that the UN needs to regain public trust with Haitians, but it doesn’t look like any states have contributed yet.